Raids have been carried out at several salmon farming sites in Scotland in connection with an EU-wide probe into alleged illegal cartels. Officials visited offices in Shetland, Stirling and Fife amid concerns they may have violated anti-trust rules. The European Commission (EC) has said the investigation is at a preliminary stage. One of the companies raided, Grieg Seafood, denied wrongdoing and said it would co-operate with the inquiry. The investigation focuses on alleged anti-competitive business practices. BBC Scotland understands it is principally centred on Norway which is outside the EU. The Scottish sites visited have Norwegian links including Marine Harvest - recently rebranded as Mowi - in Rosyth, Scottish Sea Farms in Stirling and Grieg Seafood in Lerwick. A statement from the EC said: "The European Commission can confirm that on 19 February 2019 its officials carried out unannounced inspections in several member states at the premises of several companies in the sector of farmed Atlantic salmon. "The commission has concerns that the inspected companies may have violated EU anti-trust rules that prohibit cartels and restrictive business practices. "The commission officials were accompanied by their counterparts from the relevant national competition authorities. "Unannounced inspections are a preliminary investigatory step into suspected anti-competitive practices. The fact that the commission carries out such inspections does not mean that the companies are guilty of anti-competitive behaviour nor does it prejudge the outcome of the investigation itself." 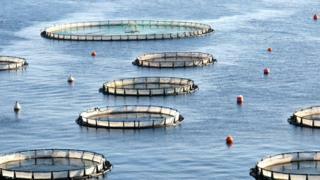 The Scottish Salmon Producers Organisation said it was aware of the inspections. "However, we understand the focus of the investigation is another jurisdiction, not Scotland," said a spokesperson. "The companies concerned are co-operating fully with the investigatory authorities and all further inquiries should be referred to the EC." One of the companies, Grieg Seafood, said the industry was very competitive and that it was not aware of any illegal practices. It added: "We have been informed that The European Commission DG (Director General) Competition is exploring potential anti-competitive behaviour in the salmon industry. They have performed an inspection today (Tuesday) at Grieg Seafood Shetland. "The salmon market is very competitive and we are not aware of any anti-competitive behaviour. We are fully co-operating with the European Commission DG Competition's investigation." A spokesperson for Scottish Sea Farms said: "We can confirm that we, like other Norwegian-owned companies in Scotland, have been visited by EC officials and are co-operating fully." Mowi, the world's biggest producer of farmed Atlantic salmon, said officials visited two of its businesses, in Scotland and the Netherlands. A spokeswoman said: "We have nothing to hide, we are co-operating with the European Commission."